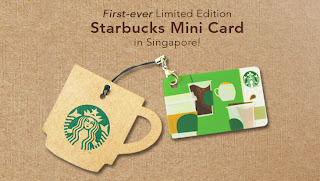 Singapore Freebies: Starbucks: Free Limited Edition Starbucks Mini Card Giveaway!! Starbucks: Free Limited Edition Starbucks Mini Card Giveaway!! Promotion is available at all Starbucks stores in Singapore except stores at Changi Airport. Redemption of Starbucks Mini Card is only available while stocks last. Promotion ends when Starbucks Mini Cards are fully redeemed at all participating stores.